Izzy started his musical career at age 5, hand-drumming on the table during Shabbat zmirot. He later served in the IDF rabbinical army band under Mona Rosenblum, and has been involved professionally with music ever since. debut CD has many pleasant surprises. 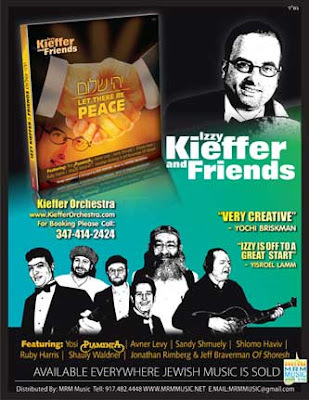 Izzy is featuring some of today’s well known artists such as Yosi Piamenta, Sandy Shmuely, Shlomo Haviv, Avner Levy, Jonathan Rimberg & Jeff Braverman to name a few. In addition to singing on several songs, Izzy has written most of the songs and arranged the album himself. Izzy took Carlebach’s Yehi Shalom and produced an incredible reggae version of that song. He did the same with the traditional "Ode Lo Ahavti Die" and turned it into a blues rockn song featuring a full horn section with Piamenta’s guitar playing. Another great one is a track called "Hamalach" a duet with Shauly Waldner (Yitsy Waldner’s Brother). There are 16 great tracks on this album catering to all styles of today’s Jewish music scene - Old School Chassidic, Middle Eastern, Persian, Reggae, and more.The songs are fun, entertaining and easy to sing. There is really something for everyone here." Just heard the album - great songs! This is a great album. AEver since I got my copy I have not been able to keep the tunes out of my head. The arrangements are excellent. Izzy is a great addition to the genre of Jewish music, and attention should be paid.